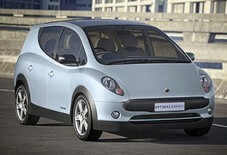 Ford will introduce an electric vehicle in 2010 as part of its restructuring plan. Optimal Energy Ltd. in Cape Town, South Africa also rolls out at the end of 2010 a stylish, moderately priced electric car called Joule (battery not included). Joule has an adjustable chassis to fit several battery configurations from different suppliers. And as an option, Joule buyers may choose to have solar panels incorporated into the rooftop for re- charging purposes. Zero emission vehicles are coming. The challenge is in finding a continuous supply of renewable energy to meet new demand. Hawaii has a renewable energy plan. The Aloha State spends over seven billion dollars annually on oil imports, but that’s about to change. Hawaii’s Governor, Linda Lingle, has announced a public- private partnership with Better Place, the California electric infrastructure company whose popularity seems to be gaining momentum each day. Hawaiian Electric Co., the state’s largest utility, has agreed to develop the network and supply renewable energy. Hawaii has great access to renewable energy, including wind, solar, wave, and geothermal sources. And because Hawaii is a fairly small market with less need for battery recharging stations, the island charging stations should be open by 2011, a year earlier than Better Place’s Bay Area network in Northern California. Right now, the challenges for Better Place and communities that partner with them revolve around maintaining the continuous electric power of the infrastructure. We aren’t usually aware of this, but utilities generate more power than their customers need. We hear about peak demand hours, when demand is so high that it is difficult for utility companies to provide power. At off peak hours there is surplus power and few places for it to go. For example, in Hawaii right now, electricity can’t be moved among the islands because of inadequate transmission lines. But proposals are in the works to build large wind farms in Molokai and Lanai, turning these two islands and Maui into a single grid. This can be done with the help of undersea cables. Oahu will get the surplus, and this is important since Oahu uses 80% of the state’s electricity. The transmission upgrade cost is high, 750 million to 1 billion dollars, but just remember how much money this state spends each year to import oil. With the electric recharge grid, off peak times will find new demand. Most people will be charging up their cars in the evening after they‘ve driven home from work. This creates a new, profitable time of day to counter peak times. In theory, at least, electric vehicles will already be charged at the beginning of the day, so they will have minimal impact on utility companies during peak times. Renewable energy sources such as wind and solar can’t provide continuous power. When the sun’s down, the power’s out. And when wind and sun are pumping out the kilowatts, it may not be peak demand time. This is where the electric recharge grid really helps out. It will always be in need of power, so green electricity will never go to waste. That’s right, there will always be an electric vehicle to use it. Israel was selected first by Better Place for electric grid networking because 90% of car owners drive less than 44 miles a day. All the urban areas are less than 93 miles apart, and even better, Israel is putting solar fields to work. Excess power from their growing solar industries will be stored in recharge grids. Peak demands put an overwhelming burden on the energy provider’s infrastructure. The electric recharge grid will act as a secondary storage system, since it is part of the utility’s network. Excess power can be off-loaded to the grid during down times and accessed when peak hours demand it. This helps stabilize the power market and gives utility companies better reason to support renewable energy. Solar fields and wind farms offer back-up and support to the main utility company. In Denmark, where Better Place has installed an electric infrastructure network, previously unstored energy from the country’s wind turbines will now be utilized. Did I say strawberry fields? It’s more than just strawberries growing in these fields. Cranberries, plums, cherries, wild blueberries, the Mariani family grows them all. They dry, process, and package this fruit at their 750,000 square foot facility. And they’ve just installed an array of 5,800 solar panels covering seven acres to help power their processing and packing plant in Vacaville, California. The solar panels will supply more than 25% of this company’s needs. I wanted to close with a delectable picture of renewable energy and highlight the interconnectedness of our world. Just think, Mariani’s surplus electricity might one day be recharging your electric car.